Distribution network of KERN is further expanded! With immediate effect, the company VS&E Valve Solutions & Expediting with headquater in Berlin occurs as official distributor of KERN Technology. VS&E is an international industry service provider of DIN and ANSI valves and components for power plant construction sectors, oil & gas, petrochemical, boiler technology and energy. The product range includes beside our products also pipes, fittings, flanges, valves, drives, instruments and accessories. VS&E will be responsible fort he postal code areas 01-09, 10-19, 39, 98 and 99 in Germany and also strengthen the international sales network of KERN Technology. We are very pleased that we could win this strong partner for the eastern region of Germany who could provide ist expertise in major projects around the the globe several times. For the power plant Lichterfelde Kern delivers the complete package on flow meters. Orifices, nozzles and venturitubes in carbon steel and also in high temperature resistant materials will be used. One measurement will be used as highly complex ASME PTC6 measurement with a total lenghts of ca 6 meters, incl. 20D inlet and rectifier. After finishing in our works, the measurement will be calibrated on an external test bench to guarranty the best possible uncertainty. 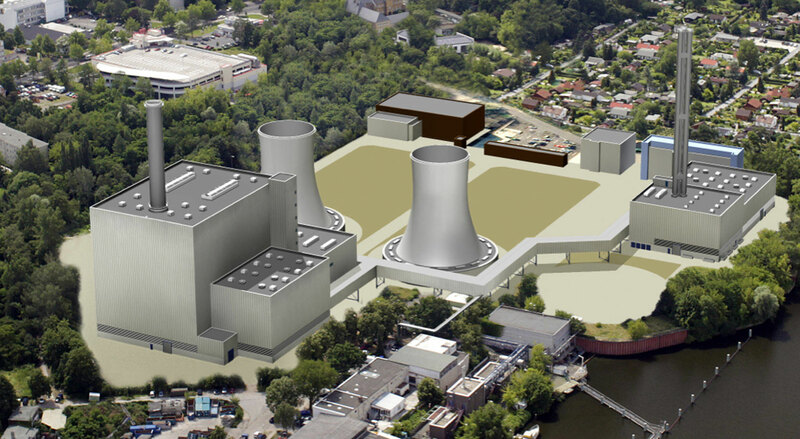 100.000 Tons of CO2 less: The newest technology for power plant Berlin-Lichterfelde! To be able to continue the supply of the south of Berlin efficiently with electricity and district heat, Vattenfall is building on the open space between the cooling towers of the old power station and the Barnackufer a significantly more efficient and climate-friendly gas and steam turbine cogeneration plant (combined cycle cogeneration plant). It’s a combined heat and power plant, which will replace the old power plant on the same site. The new, natural gas-powered plant will produce up to 230MW of district heat and 300MW electricity. Compared to the existing plant, the new one can reduce the carbon dioxide emissions to more than 100.000 t yearly. Groundbreaking for the new power plant was in May 2014; by the end of 2016 it will supply 100.000 households in the southwest of Berlin with electricity and heat. Larger power plant projects in Germany are rare these days: „We are happy that we’ve been awarded for this prestigious project in our Capitol“, said the brothers Kern. We at KERN have been involved in the massive expansion of power generation capacity in Poland ! Located between Wroclaw and Katowice in south-western Poland, the power plant in Opole is to be equipped with two new blocks at a capacity of 900 MW each in an investment project to the tune of € 2.8 billion. This particular construction project is part of an extensive nationwide investment programme aimed at securing the energy supply in Poland, and encompasses power generation facilities, state-of-the-art electricity grids, gas pipelines and warehouses, and a gas terminal. Kern will be providing many measurements for the power plant of OKI Pulb & Paper Mills in South Sumatra/Indonesia. We will produce orifices and nozzles in stainless steel, carbon steel and heat-proof/heat-resisting steel. The new plant is expected to produce about 2 million of pulp annually. The commercial production starts in 2016. Kern deliver flow measurements and accessories for CCPP in San Gabriel! Beside monitoring measurements and draining devices we will also deliver high-precision billing-measurements which will be calibrated for best possible uncertainty values. Project San Gabriel is an combined cycle power plant (CCPP) in Southeast Asia (Philippines) with a capacity of 414 megawatts (MW). Kern Technology will be providing many venturi nozzles to the YANBU 3 power station in Saudi Arabia that also comprises a seawater desalination plant. Beside the venturi nozzles we are also responsible for delivery of the complete transmitter technology incl. the necessitate accessories. From 2017, the power station fired with heavy fuel oil and located at the shores of the Red Sea will generate more than 2700 MW of electricity at five units. It will be used to supply electricity to the west of the country, for example, to cities like Jeddah, Mecca and Medina. The associated seawater desalination plant, which will make use of the power station's electricity and accumulated steam, is to provide 550,000 cubic metres of drinking water per day. Kern Technology was instructed to equip the new combined cycle power plant (CCPP) in the chemical park in marl with flow measurements! Kern Technology deliver the complete range of flow measurements according DIN EN 5167 for this highly efficient and economic combined cycle power plant (CCPP) in the chemical park, Marl (Germany) Orifices, ISA 1932 nozzles and venturi tubes will be used in this power plant. Marl Chemical Park is the third largest integrated industrial site in Germany and at the same time the biggest production site for Evonik. The Marl Chemical Park stands out due to its excellent infrastructure and customized range of services. Large international companies, such as Air Liquide, Air Products, Evonik, INEOS Styrenics, Ashland, LANXESS Buna, DOW, Sasol and VESTOLIT are already manufacturing at this site. But small and medium companies will also find ideal connection options here. Kern Technology receive order for two projects in Scandinavia! The Swedish city of Linköping, known for its university and industry, will carry out to build a new incineration line, which is set to go into operation in 2016 as an extension to the existing Gärstadverket waste incineration plant with an incineration capacity of 260,000 tons per year. The energy generated from the waste incineration will be converted into electricity and district heating and will therefore make an important future contribution to the sustainable energy supply in the region. Also in Tampere, Finland's third-largest city, a thermal incineration plant will be erected. Tampere can reflect back on a lengthy tradition of electrical power generation. The company Tampereen Sähkölaitos Oy was established back in 1888, with the aim of driving the electrification of the city. At this time, Tampere was one of the first cities in Europe to commence with the development of municipal power generation. The plant, with an incineration capacity of 180,000 tons per year, is scheduled to go into operation in 2015 and is specially designed for the incineration of a broad spectrum of waste. Kern Technology deliver the flow measurements for both projects.